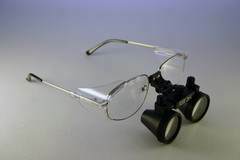 American Made these loupes are the best value in the market. As good as any German set but lighter and cheaper. Working distance 280mm. This is the distance from the loupe to your hands. Choose a distance that suits the way you like to work. Some like to work close to the subject and others further away. Field depth 125mm to 200mm. This is the range over which the object stays in focus. The higher the magnification the more sensitive this becomes.